The RECODE team is pleased to welcome Kelly Hodgins to a new role as Program Officer. Familiar to many in the RECODE Network from her time at the University of Guelph, Kelly brings to RECODE “on the ground” perspectives and experiences from her time managing social innovation programs at Guelph. 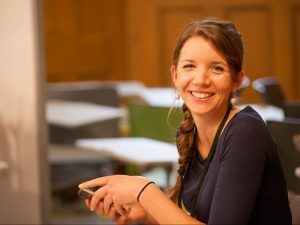 Kelly has a strong track record of community impact and supporting student changemakers, and we are excited for her to apply her knowledge-mobilization and relationship-building skills across RECODE’s activities. With hellos come goodbyes, and we want to express a heartfelt thank you to RECODE fellow, Jennifer Gammad Lockerby as she wraps up her time with us. Over the past year we’ve benefitted greatly from Jen’s strong communication skills, critical eye, and sound judgement. Her legacy at the Foundation will continue via the many resources she helped produce, and also by starting McConnell’s first ever Youth Committee. We wish Jen the best of luck in your new role as a Strategic Communications Officer at the Foundation for Media Alternatives in the Philippines.